TUTUNUI-WANANGA-LOKAHI: "U.S. NAVY: 'ENVIRONMENTAL STEWARDS' OR AGENTS OF ECOCIDE?" 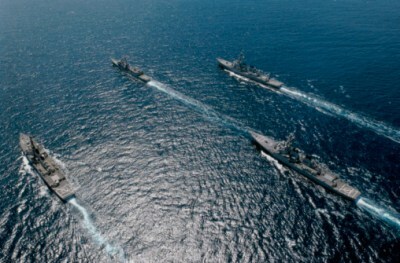 "U.S. NAVY: 'ENVIRONMENTAL STEWARDS' OR AGENTS OF ECOCIDE?" The purpose of this posting is to identify and draw attention to a blatant example of what I call ‘military-industrial green-washing’, which is the utilization of the full spectrum of ‘perception management’, ‘public relations’ and ‘engineering of consent’ techniques to convince an unwitting and uncritical public that all-things-military, all-things-industrial, all-things-bureaucratic, all-things-nuclear, and all-things-deadly are actually life-sustaining, absolutely safe, clean, green, harmful to no one or no thing, and are in fact there for the benefit of you and the environment. The Navy funds and/or directly controls almost ALL marine biology researchers and institutions in the western world. They would have us believe that the reason they spend tens of billions of $ annually on ‘research’ is so that they can do a better job of protecting the environment. The truth is a little different; for example, the Navy alone owns and operates more nuclear reactors than America and western Europe put together. Put simply, they specialize in weapons systems; mass-media is the biggest weapons system ever created. Another de facto ‘weapons system’ indirectly targeting any life-form in the sea is towed-array seismic exploration technologies using compressed air guns whose sound pressure levels can, like LFA-sonar, exceed 250 dB. This is a trillion times louder than a Rolling Stones concert from the front row. 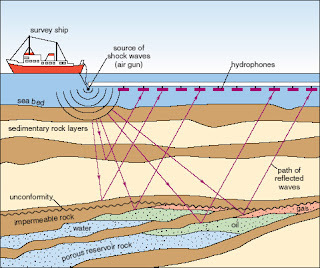 Hundreds of ‘geophysical exploration’ vessels can be in operation at any given time, all with ‘kill zones the size of Texas.’ Not that many would be needed for a "kill zone the size of the Earth." STILL THINK THE JAPANESE ARE THE WHALES’ BIGGEST ENEMY??? "The U.S. Navy has developed an extremely powerful Low Frequency Active (LFA) sonar to detect "quiet" submarines, and it has applied for a permit from the National Marine Fisheries Service (NMFS) to deploy it. However, based on newly available scientific information, this low frequency sonar produces a high intensity sound that, at 150 to 160 decibels, can kill whales, other marine mammals and marine fish by rupturing the delicate membranes surrounding the lungs, swim bladder, or other enclosed air spaces. The second lethal effect of LFA sonar involves the activation of supersaturated gas in marine animals' blood and in their cells to form small bubbles which can block the flow of blood in the brain (causing stroke) and can rupture the cell walls. This effect will be greatest in deep-diving animals (such as bluefin tuna, swordfish, bigeye tuna and deep-diving whales) that will have the highest levels of supersaturated gasses in their blood and cells. 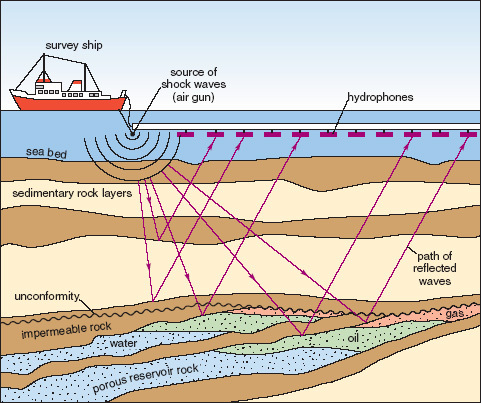 The source level of this sonar is 240 decibels (equivalent to the intensity of a Saturn rocket). But, because low frequency underwater sound can travel hundreds of miles with little loss of power, it will actually create a "kill zone" several hundred miles in diameter. 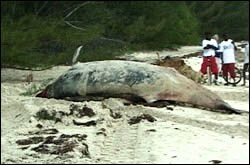 NATO naval exercises using low frequency sonar conducted off Greece in 1996 killed whales that were more than 100 km away. In the final EIS for its sonar system, the Navy admits that an intensity of 160 decibels (a lethal level) will be felt several hundred miles away from the source. This will create a "Kill Zone" the size of Texas. The Navy says it wants to deploy this sonar in 80% of the world's oceans (omitting only the Arctic and Antarctic)"
"The Navy is facing existing and emerging threats from foreign naval forces. For example, several non-allied nations are fielding new, quiet submarines. 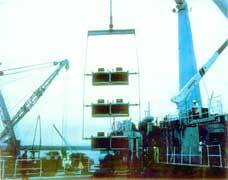 New anti-ship, submarine-launched cruise missiles are also being introduced. When quiet submarines and anti-ship cruise missiles are combined, they pose a formidable threat to our sailors and Marines, who are called upon to project power from the sea and maintain open sea lanes.Show citation box In order to successfully locate and defend against these threats, our sailors must train realistically with both active and passive sonar. In executing anti-submarine (ASW) missions, sonar is the key to survival for our ships and sailors. The employment of SURTASS LFA will enable the Navy to meet the clearly defined, real-world national security need for improved ASW capability by allowing Navy Fleet units to reliably detect quieter and harder-to-find foreign submarines underwater at long range, thus providing adequate time to react to and defend against the threat, while remaining a safe distance beyond a submarine's effective weapons range. The U.S. and its military forces must have the ability to project power decisively throughout the world. A key to the ability of the U.S. and its military forces to project power is the protection of U.S. and allied forward deployed Naval units against the threat of opposing force submarines. Of the approximately 500 non-U.S. submarines in the world, 224 are operated by non-allied nations." 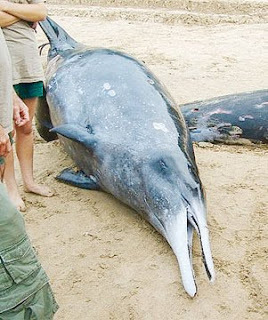 "On August 17, 2011, NMFS received an application from the U.S. Navy requesting authorization for the take of individuals of 94 species of marine mammals (70 cetaceans and 24 pinnipeds), by harassment, incidental to upcoming routine training and testing of the SURTASS LFA sonar system, as well as the use of the system on a maximum of four U.S. Naval ships during military operations in certain areas of the Pacific, Atlantic, and Indian Oceans and the Mediterranean Sea from August 16, 2012 through August 15, 2017. The National Defense Authorization Act of 2004 (NDAA; Pub. L. 108–136) amended the MMPA by removing the 'small numbers' and ‘specified geographical region' provisions and amended the definition of 'harassment' as it applies to a 'military readiness activity.'" "...In many regions, the Navy plans to increase the number of its exercises or expand the areas in which they may occur, and virtually every coastal state will be affected. Some exercises may occur in the nation's most biologically sensitive marine habitats, including National Marine Sanctuaries and breeding habitat for the endangered North Atlantic right whale. In all, the Navy anticipates more than 2.3 million takes (significant disruptions in marine mammal foraging, breeding, and other essential behaviors) per year, or 11.7 million takes over the course of a five-year permit..."
This article cites Dr. Tyack as stating that the LFAS is no more harmful to the whales than the noise from whale watching boats. While there may be differences of opinion on the potential damage LFA can do to whales, there are few in the scientific community who could compare the power of LFA with the noise from a whale watch boat. "What's the difference between the Pacific Ocean and the Dead Sea?" "The Pacific's a lot bigger."